The guild system in this game is set up to be a progressive feature and is quite impressive, to be honest. However, much like anything living, without a head it dies. The only flaw the system has is that a guild cannot progress without an active lead. I wrote this guide to help people who are in a nice guild but have an inactive leader, more or less because there isn’t much clarity on this topic. There is a solution. But it requires a lot of patience and is really quite weary, really. So first you need to calm your ***s because this process takes a total of 13 days. I know.. Whoever came up with this solution didn’t take into account that this game is competitive. And that guild progression is equally as important to this game as everything else and scotch. 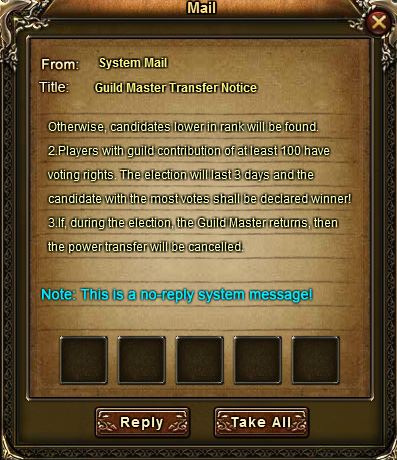 will select candidates from the officer ranks and bellow if even your officers are inactive. Furthermore, only guild members with at least 100 contribution points may vote. 3 days after, and a total of 10 days, all members yet receive another notification mail (left pic) to start the official election. 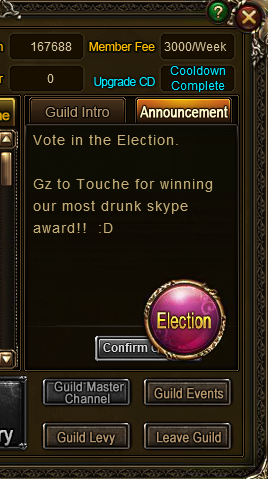 The election button (right pic) then appears on the guild interface..
on the lower right side just above the guild events button. The elections will run for another 3 days making a total of 13 awesome days! 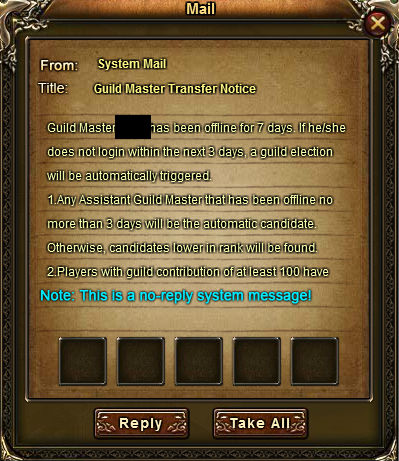 Dear god, I hope your guild survives that long. 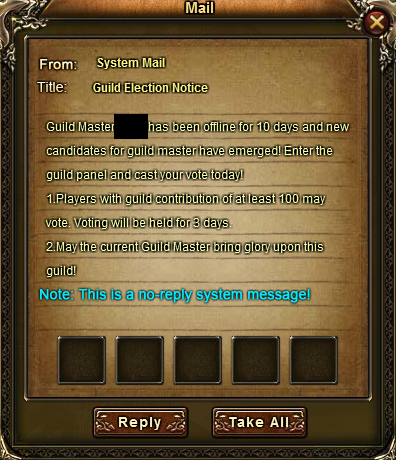 Oh, should your guild leader decide to log in during the actual elections, then the election and leadership role transfer is nullified. The outcome is obvious, whoever your candidate is becomes the leader and everyone can rejoice. However, if your guild is a low leveled guild you might as well just make a new one as it only takes fewer than 13 damnable days to level your guild up to where your guild leader left off. Spend all your contribution so they don’t go to waste before you ditch. And remember, guild leaders, don’t be a jerk.